What is your favorite distance why? I have trained to race marathons for the better part of 12 years now so, that should probably be my answer but I am starting to appreciate the half marathon! The shorter distance allows you to push just that little bit harder and the recovery is much quicker than going hard for a full marathon. I can state without any hesitation that I hate 5k’s! What do you struggle most with in running? I have always been very self-motivated to run, especially when I have a goal in mind whether that is a race or particular time. My big struggle is with time spent away from family. Most of my running is planned around when not to take away from family time so mainly before work. Do you rotate shoes and if so, what is in your current rotation? I rotate constantly, based on the workout type. For recovery runs I am currently wearing Hoka Clifton 5’s, these are the days where the extra plush feels good! For speed work I wear New Balance Zante 5 and for my shorter ‘long run’ pace workouts I use my marathon race shoes which are Adidas Boston Boost 7 right now. Finally for my true long run, I wear Mizuno Wave Rider 21. I find that I thrive on structure. I follow the training plan explicitly and rarely change anything up. When race day comes, I try to keep myself as calm as possible and often sing to myself (inside my head!) to maintain a calm composure. Do you ever feel unmotivated to train and if so, how do you overcome it? I have long found running pleasurable, it is my time to clear my head and just be. I rarely struggle to get out the door although having a goal race does always add that extra drive. I would say friendship. 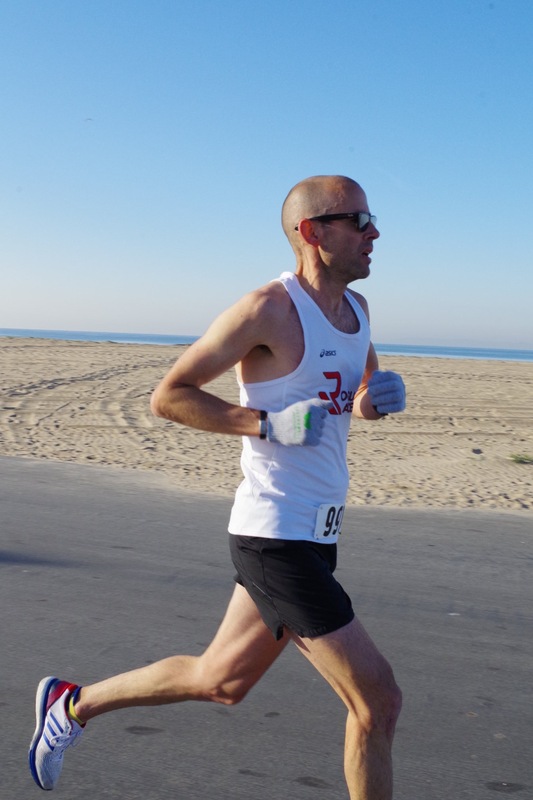 Although I am back to being a solo runner largely for now due to a relocation to California, I have developed many great friendships through running that I am fortunate to have been able to maintain over the years and the miles. This is a tough one! It’s a close call between New York City and Boston. I will have to say Boston due to the history and honor of being able to participate. Once it was a pipe dream to line up in Hopkinton, I have a proud streak going at the event now and look forward to returning to Boston every time! I started running late. Although I did run occasionally when younger, I never did so with any consistency. I finally got into a routine while living in New York. In 2005 I lived along the course of the New York City Marathon and was inspired watching the masses running past my home. Little did I know then that 3 years later I would myself run that same course as my first marathon. As horrendous as it sounds, probably Yasso’s! Assuming they are run well of course! 19, with numbers 20 and 21 quickly approaching in April! My answer changes over time but, for now, Eliud Kipchoge. His recent achievements at the marathon are inspiring and the very valiant attempt to ‘Break 2’ kept me riveted to the screen at 2am! He is humble and modest, and an inspiration with a great smile! Easy. Boston 2018. Quite unbelievable. I have never ever run in conditions so horrendous, and I was woefully unprepared. Just 24 hours prior, I was scrambling to find gloves and arm warmers to help with the anticipated cold and had to make do with poor options. Even on race morning I switched up my outfit! Any attempt to stay warm or dry was useless anyway, we all started the race soaked and on finishing quickly slipped into uncontrollable shaking through extreme cold. Having trained extremely well for the race I went out very hard and paid for it at the end. My last miles were miserable for both the weather and the pain I was in. On finishing I recall a volunteer asking if I needed any help and my simple request was for her to help me open a bag of chips from the recovery bag, I was too numb to manage it myself! Boston is a truly remarkable race and the 2018 event will never be forgotten for the conditions we endured. Do you have a goal race that you haven’t done yet and why do you want to do it? This April I will run the London Marathon for the first time. As my birthplace marathon, this has been on my wish list for many years. I was able to gain acceptance to the event through a time qualifier and will line up for it just 13 days after the 2019 Boston Marathon! On completion I will have completed 4 of the 6 Marathon Majors so, continuing with the question, Tokyo and Berlin are my next goal races to complete the set! Despite an extremely large music collection, I have not listened to music while running for years. I stopped in 2011 when we moved to California. I started running early morning then and on busy streets, I wanted to be more alert to traffic/early risers so I dropped the earphones and have not picked them up since! I find running calming now, I enjoy the silence of the early mornings when I can be with my own thoughts.